A team of researchers based at the North Carolina State University has created a sensor that uses the residual heat generated by your body and turns it into actual thermoelectric power. According to a report released by NC State, the prototypes that have been developed are, "lightweight, conform to the shape of the body, and can generate far more electricity than previous lightweight heat harvesting technologies." And while said experimental technologies are a long way off the human AAA batteries we saw powering the machine world in The Matrix - the research team confirmed the sensors aren't powerful enough to power something as juice-hungry as a smartwatch - it could the way low-level medical sensors are used, removing the need for awkward cables. 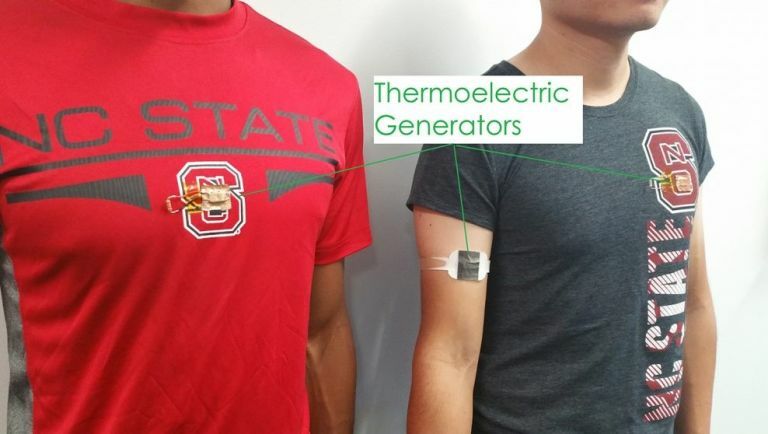 "Wearable thermoelectric generators (TEGs) generate electricity by making use of the temperature differential between your body and the ambient air," says Daryoosh Vashaee, an associate professor of electrical and computer engineering at NC State and corresponding author of a paper on the sensors. He adds: "Previous approaches either made use of heat sinks – which are heavy, stiff and bulky – or were able to generate only one microwatt or less of power per centimeter squared (µW/cm2). Our technology generates up to 20 µW/cm2 and doesn't use a heat sink, making it lighter and much more comfortable." The sensors, which use a special conductive material topped with a polymer layer, work best when strapped to bare skin (the upper arm is apparently the best place for heat harvesting), but the team has prototypes in the works that also work through t-shirts. However, these ones aren't quite as powerful.